With February being the month of LOVE we felt it was time to practice some “SELF LOVE”. Pressure of the modern world can very often leave us all feeling inadequate. In reality the very fact that we don’t find ways to value and love ourselves directly impacts upon the way people perceive you and the way you feel day to day. We’ve created a box this month to help you to love yourself just exactly as you are! All UK subscriptions include a sweet vegan treat. You will have all seen turmeric feature in our boxes over the months and the reason being there are so many benefits to the wonder product and we want you to have the best! Check out https://www.cognitune.com/turmeric-curcumin-benefits/ for more information around how turmeric can benefit your all round health. Our blog post for January failed to load but just incase you didn’t purchase/subscribe with us during January you will find full box contents below. Watch this space for our February “LOVE'“ themed Mindful Gift Box. * All subscribers based in the UK will also receive a sweet vegan treat. The festive season is upon us and we have a treat for you this month with our RELAX themed box. This would make a perfect Christmas gift as a one-off or subscription. Remember you can subscribe for three months if you are purchasing as a gift for someone else and this can be done via out SHOP NOW page. 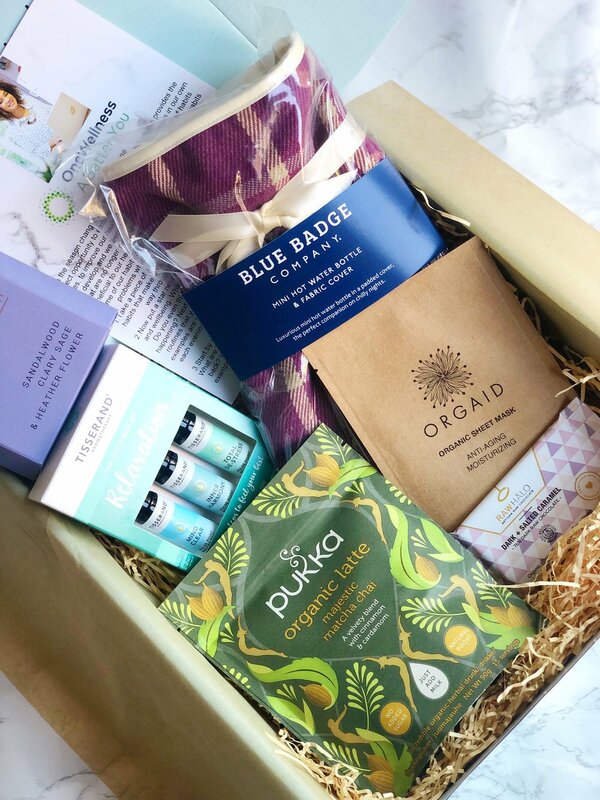 As the end of the year draws ever closer we wanted this months box to be a time for reflection and relaxation over the Christmas period. From this month all of our boxes will also include a newsletter from celebrity GP Dr Helen Lawal, she will provide tips and advice around how to stay and live well. All subscriptions will ship on 19th December for this month only. I hope you are all mindfully working on your embroidary from last months Jenny Blair kits. We spent a lot of time getting these right and hope that once complete you can find a nice place for your finished piece. This might be in a frame or further stitched onto a garment etc. It would be great to see some of your finished work so please tag us @mindfulgifting! I know crafting isn’t for everyone and for that reason we try to keep our monthly box contents as varied as possible. This month our box focuses on NOURISHING the mind, body and soul from the inside out. The Daily Promise is a tool to help you start each day with a new intention, a positive intention. It is so easy at this time of year with the dark nights drawing in to feel a little lacking in energy, positivity and drive. Read one of the daily promises with your Pukka Three Tulsi and start the day right. Three Tulsi is known for bringing clarity and relaxation. In addition to this we have a number of indulgent treats for the hair, skin and body, these are a perfect way to bring back your vibrance from those summer months leaving hair silky soft and skin glowing, this also makes for a perfect gift as party season draws ever closer. We’ve had some great feedback from our KINDNESS box last month and again this has been an absolute sell out. We are really excited to announce the contents of this months box which has a MEDITATE theme. Meditation is a really useful tool when trying to be more mindful, we have included an item which will help to distract your mind and take away the worries and stresses of our daily lives. Combined with other products that will support you in your meditation practice, this box is a real treat. For those subscribing between 1st October - 25th October your first box will be sent on 27th October. All other One-Off Box purchases will ship within 1-3 days of purchase inclusive of a personalised letter, you can purchase throughout the month. Subscribers - All UK subscriptions include a sweet vegan treat. Note - completed embroidery kit is for demonstration purposes only. Our September box theme is KINDNESS! Kindness can be present in various forms, we can be kind to ourselves which is often the first form of kindness that springs to mind and there's absolutely nothing wrong with self care, in fact we encourage it! However, for us kindness is a way of life. It's about the decisions that we all make day to day. It might be the choices we make when doing our weekly shop...to be kinder to our environment? It might be something as simple as saying something nice about someone or making contact with friends & family. Our belief is that if we we're all a little bit kinder, the world would be a better place. So, this months box is our contribution to being kinder to yourself/others and the environment we live in. Our subscribers will also receive a surprise sweet vegan treat in their box! For those subscribing between 1st September - 25th September your first box will be sent on 27th September. All other One-Off Box purchases will ship within 1-3 days of purchase inclusive of a personalised letter, you can purchase these throughout the month. This month our August "Energise" Box has SOLD OUT! With more subscribers now than ever, we are grateful for all of your support. There will only be a select number of items from the August box available for individual purchase via the website from 1st September. You can still continue to purchase individual items from our SHOP NOW page. Our September "Kindness" box will launch on the 1st September, watch out for our next blog post with full details and SPOILER ALERTS on our social media pages. Enjoy the rest of the bank holiday everyone! Today we will be hosting a sale on all individual items on our website shop. 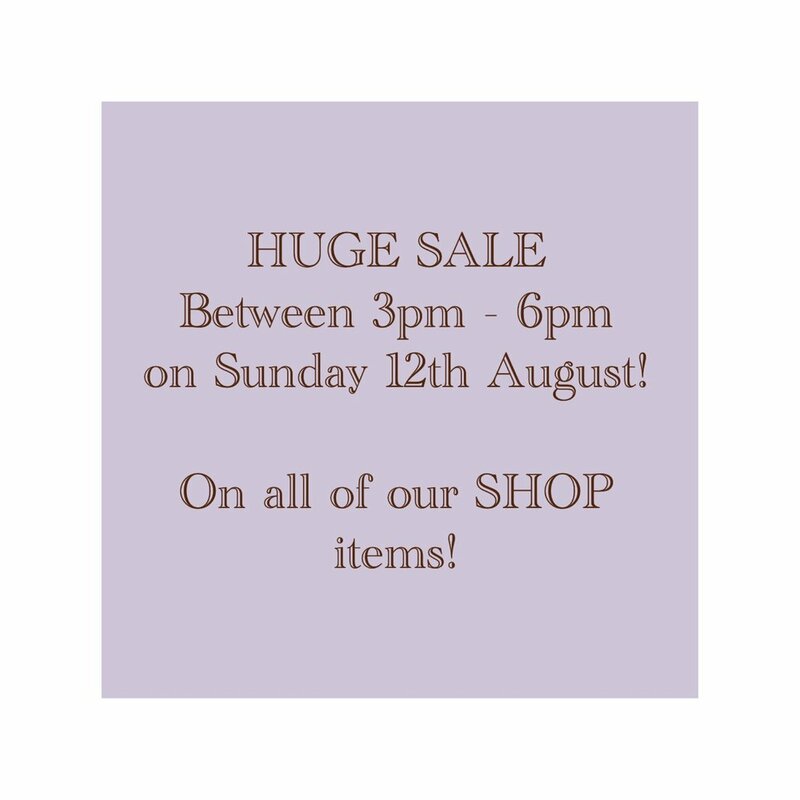 This is a one-off sale and will last from 3pm-6pm on Sunday 12th August, 2018. No discount codes will be required, all qualifying items will be listed in the SALE. There are a limited number of bespoke incense burners available so you will need to get in quick if you want one of these!! Make sure to hit our website at 3pm to get the best deal.